Indoor tanning has always been around, but little do most people know that you don’t need to bake yourself in the sun for hours to to get the best tan anymore. Sunless tanning is the new craze, especially among young adults. It’s also called UV-free tanning, spray tanning, self tanning or fake tanning. The process involves applying various chemicals on the skin in order to produce an effect similar to sun tan. The idea of sunless tanning has been gaining immense popularity in recent years, also largely due to the growing awareness of skin cancer. Varieties of indoor tanning lotions are available on the market, which have been designed for sole purpose of accelerating the tanning process. What these lotions do is they promote the production of melanin. These lotions aren’t meant to be used to be in the sun; instead they are used with an ultraviolet source, such as a tanning booth or bed. Note: The best tanning lotions aren’t exactly healthy since they make our skin sensitive to ultraviolet rays. In fact, they aren’t even approved by the FDA. However, knowing your limit and choosing the best products should keep you fairly safe, and also give the tanned skin you desire. 1.1 How to choose the best indoor tanning lotion? How to choose the best indoor tanning lotion? What are the things that you need to know in order to choose the right tanning lotion? Moisture is extremely important when tanning, especially if you are considering using tanning beds. Your skin will tan at a much faster rate when it’s moist compared to when it’s dry. Also, the tan stays on for a longer period. Additionally, moisturizers also help to protect the skin cells. The best moisturizers contain vitamin E, silicon, hemp seed oil and shea butter. Tanning lotions with bronzers are used to darken the skin on top of a sun tan. Bronzers help to tan your skin at the same amount of time taken for tanning because of its major components DHA, beta carotene and vitamin A. These chemicals work on your skin to darken the pigmentation. As the terms suggest, tanning lotions rich in accelerators and maximizers help to increase the tanning speed. Chemicals present in these lotions are amino acids such as psoralen and tyrosine, vitamin A, etc, which are crucial for the body to secrete melanin at a faster pace. More melanin means darker tan. Most tanning lotions with maximizers also contain moisturizers to aid in skin protection and maintain a good base tan. The best indoor tanning lotions are known to not just provide a good base tan but also increase the healing process of the skin. Tanning lotions that tingle don’t just cause a chemical reaction to darken the skin pigmentation. The blood flow increased by the application of the lotion also aids in the repair and healing process of the skin. There is more to tanning than just applying lotions. One of the ways to help tighten the skin and reduce wrinkles, as well as maintain a healthy tone and glow of the skin is to use chemicals like caffeine and other anti-aging ingredients. Also, using scented tanning lotions will heat scent right into your entire body. Millennium Tanning Products are among the successful sellers of wide varieties of tanning lotions. This one in particular has been specifically designed as a tanning bed lotion using auto-darkening tan technology. The total amount available in a bottle is 13.5 oz. fl. (400ml). The lotion consists of a wide range of chemicals, all assisting you into instant darkness, skin wise. The bronzers in the lotion assist in the secretion of melanin, which speeds up your tanning process. This tanning lotion also features ultra moisturizers, which not only helps to maintain a good tan, but also protects your skin. This lotion leaves a soothing smell after tanning. Most tanning lotions leave a burnt smell after tanning that is really uncomfortable. The tan color is pretty nice, and not at all orange. Your skin color will look almost natural. The silicone in the lotion makes your skin soft and smooth after you’re done tanning. Regular application of this lotion is a must; otherwise you’re just going to wash it off in the shower. Make sure you apply this lotion evenly throughout your body, or you’ll be seeing missed spots, which of course is not at all what’s supposed to happen. Make sure you wash your hands properly and remove that extra bit of lotion, especially between the cracks of your fingers. Or, your fingers will look crisp orange. This tanning lotion will work best for you if it’s the right product for your skin type. So, you might want to find out about that. Overall, it’s a fantastic product from Milennium. It’s not regarded as #1BestSeller on Amazon in its product category for nothing. It’s a tan enhancer with silicone bronzer, so if you’ve already got a good base tan, this product will work even better for you. Just make sure you use the right amount of lotion and spend enough time on the tanning bed in order to get the best results. 400ml is a decent amount of fluid for the price. The price tag itself beats half the competition on the market. It offers amazing value for money. Fake Bake Flawless tanning lotion is another stunning option for you on the market today. Like the name suggests, it gives you amazing tanning without having to bake yourselves in the sun. The company has taken proper care to combine the ease of application and intense color development in a short time, which is exactly what’s needed in a tanning lotion. It’s best to apply the lotion with a professional mitt, which is also included in the packaging. The total quantity present in the bottle is 6.0 fluid ounces. This lotion leaves a pleasant tropical scent afterwards, so you’ll definitely be going back for more. The dual function cosmetic bronzer featured on the product assists in making the use of this lotion even easier. You see exactly where it’s going as it provides an instant golden tan. This formula has been made to be fast drying and fast absorbing. You don’t have to worry about it transferring to anything. The exclusive triple tan formula used by Fake Bake helps this product to last longer. Because it’s rich in tanning chemicals, it should work for all kinds of skin tones and types. The spray bottle that comes with the product seems to be too long, which causes leakage from the bottle. A solution would be to cut the tube to exactly the length you need. This will help prevent the leakage. The durability of the mitt is completely on you. You are only supposed to use it lightly. Also, you should wash your mitt after every single use in order to maintain its longevity. Because it’s a fast drying product, it’s not a good idea to have too much on your hands, unless you like your fingers crisp looking. Just use gloves for even results. It’s truly a fascinating product from Fake Bake. The tested and proven formula provides maximum results. You’ll feel the results instantly as it dries super fast. Just keep in mind the precautions you need to take with this product and you should be fine. Applying the lotion with a mitt should provide you with an even, smooth tanning. Additionally, you get a soothing tropical scent afterwards, which further adds to the selling points of this product. For all its capabilities, it’s not that expensive either. It offers great value for money. The company claims the Tan Physics True Color Sunless Tanner to be the number 1 rated product in its category, and it rightly seems so. The formula from Tan Physics contains all the necessary ingredients for an effortless yet long lasting tan. It’s a great self tanner and also contains components like moisturizer, and anti-aging chemicals, helping the tan hold for longer period, and assisting in the skin recovery process. It’s truly an amazing tanner that not only keeps the skin tanned, but also maintains the help of the skin cells. The moisturizer, along with other chemicals present in this lotion helps to hydrate, replenish and restore your skin, while continuously maintaining the tan. No need to get professional indoor tanning once you have acquired this product. You’ll be saving a good deal of money, time and aggravation with this purchase. This lotion dries pretty fast, so you don’t have to sit with the lotion on for too long. There is no strong lotion with this product. Most similar products tend to have a strong burnt smell. The bottle it comes in only holds 8 fluid ounces of the lotion, and it features a hefty price tag at that. Most similar products are offered at half its price tag. There have been complaints about the product being ineffective even after a week of regular use. So, either the company shipped out faulty products, or this product is only suitable for specific skin types and tones. This tanner only seems to fit for specific skin types. There have been mixed comments about its effectiveness and lack of it. So, you’ll want to do a proper research on whether or not the product works for you before buying it. This is a quality tanning lotion, but its hefty price tag has made it extremely difficult to rate it as good value for money. It’d be safe to say that if you are not concerned about the money you spend on your tanning lotions, this should be a great buy for you. Because of the negative reviews about the product, you must make sure this product works for you. It’s got a nice scent and it’s incredibly easy to apply. Millennium Tanning Products has managed to establish itself as one of the reputed brands on the market today. Not only do they offer quality products, they do so at a remarkably inexpensive price. This Millennium tanner is slightly different than the earlier product on this list. It features 50X auto darkening tan technology and it not only tans your skin, but also keeps it soft and smooth. The dark tan color lasts all day and you’ll have to apply it regularly for best results. It smells pretty good too, which for some reason isn’t a common feature in all effective tanning lotions out there. The silicone emulsion blend leaves used in the production of this formula reacts with your skin to provide a silky smooth and soft skin after the tanning. The moisturization seem to last all day along with the tan, so you won’t get any dryness or after effects. You get the smell of a fresh and clean cotton blossom with this lotion. After applying this tanner, your whole body will have this pleasant fragrance, making you go back for more of the same. This product accelerates the tanning process and assists in bronzing, skin firming and silicone emulsion. Most skin types’ burn easily without the use of a lotion. Well, you don’t have to worry about that with this formula. There have been few complaints about the side effects of using this tanner. Allergies and rashes have been seen on the user afterwards. However, this is not something that occurs in everyone, as it’s mainly because of the skin type not accepting the formulae. Skin type seems to be an issue with this product, as it clearly doesn’t work with all skin tones and types. There have been complaints about faulty products being shipped from different sellers, so you’ll need to be careful not to be conned. If the product you receive isn’t sealed tight, you might as well return it. It’s one of the best tanning lotions out there. 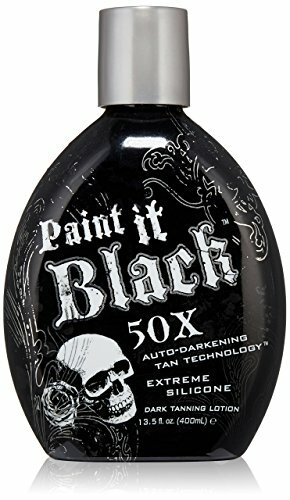 This tanning lotion is available in a badass bottle, with a skull and everything. The fragrance is pretty amazing and the effects of this lotion even more so. The dark tan you receive from this is almost unbeatable, especially for the price of the bottle. Also, the bottle holds 13.5 ounces of fluid, which is nearly double than what most manufacturers sell for the price. Overall, it’s hardly got any areas to complain about. It offers great value for money. This is a bit of a unique product on our list. It’s largely a moisturizer rather than a tanner. Hempz is a brand that has been in the business for a long time and its pure herbal extracts have got immense popularity. This particular herbal body moisturizer is a product that has been designed to keep your skin healthier with its hydrating and nourishing characteristics. Skin conditioning is a key way to maintain a good tan, and also keeping your skin healthy. One of the best things about the lotion is its great smell. Using this lotion before moisturizers will remove the lines on your face and help rejuvenate your skin, providing you with healthier and younger looking skin. This lotion soaks into your skin effortlessly and keeps it hydrated and well nourished. It’s not as greasy, which in itself is a massive selling point. Most other products in the category are too greasy and feel uncomfortable. At least, it’s bearable. The quality of the lotion feels pretty cheap. Also, there have been complaints about the product not being an authentic Hempz product. If your skin is extremely dry, it’s not the product for you, as your skin will fail to absorb it. The scent is bit too strong. Even though it’s pleasant, it can get extremely irritating after a while. There doesn’t seem to be much information on the back of the bottle, other than the directions on how to apply it. 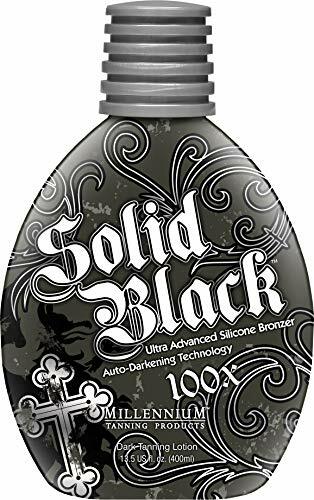 Although we have been reviewing tanning lotions, keep in mind that this is not a tanning product. Nonetheless, it’s an extremely important product for those of you who tan regularly. Your skin needs proper nourishing and hydrating, which is often taken away by the tanning process. Although, tanning lotions are claimed to contain moisturizers and hydrating components, it’s just not the same, since the major focus is to darken the skin pigmentation. The product from Hempz will not only keep your skin hydrated, but also give you a healthier and younger look. Your skin will remain conditioned with regular use of this product. It’s good value for the price it’s being offered at.